Many different types of Single Leg Slings can be made from the basic Body Styles by adding attachments and fittings. The Single Leg Sling is the basic sling. 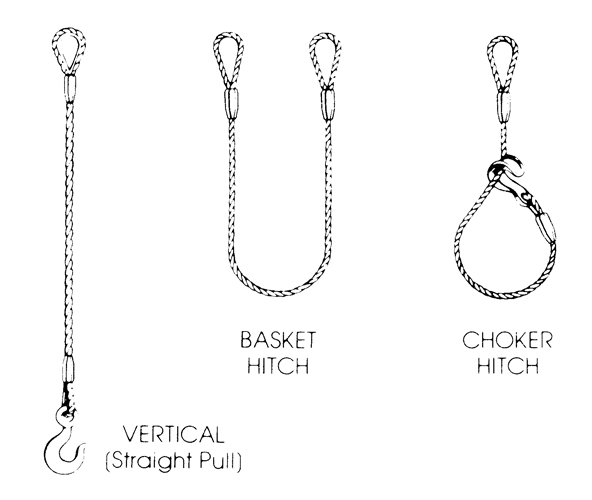 It can be used “Vertical” in a straight pull application; in a “Basket Hitch” around the load; or in a “Choker Hitch” around the load. Figure 7 — Single Leg Slings in Commonly-Used Hitches. Figure 8 — Typical Multiple Leg Slings. An Endless Sling of General Purpose or Cable-Laid Body can be extremely useful for special lifting applications. 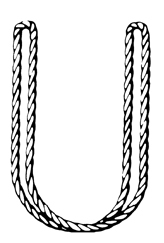 Endless Slings are of three basic types: (A) Mechanically Spliced; (B) Hand Spliced; and, (C) Grommet. The length of an Endless Sling is the inside circumference. A. MECHANICALLY SPLICED ENDLESS SLINGS — A single length of wire rope can be formed into a loop by using metal sleeves. Either 6×19 or 6 x 37 Rope Classification, with fiber core (FC) or steel core (IWRC), can be used. The great pressure applied during swaging causes the sleeve metal to cold flow around the strands and wires of the rope making a strong connection. This same procedure can be used with cable-laid rope. Mechanically Spliced Endless Slings are used for all types of lifting applications, especially where lifting of very heavy loads is encountered. B. HAND SPLICED ENDLESS SLINGS — A single length of wire rope can be formed into a loop by joining the ends together using a special long splice. This type of Endless Sling is most frequently used when the circumference of the sling loop is large and/or when the large diameter of the pressed sleeves of a mechanical splice cannot be tolerated. C. GROMMET ENDLESS SLINGS — A Grommet Endless Sling can be made from either wire strand or wire rope. A Strand-Laid Grommet is an endless loop of wire rope made by hand from a continuous length of strand. The finished grommet has a body of 7×19 or 7×37 Classification. A Rope-Laid Grommet is an endless loop of wire rope made by hand from a continuous length of 6 x19 or 6 x 37 Classification wire rope. The finished grommet has a cable-laid body Grommets have their widest usage in endless slings having a ,short circumference. 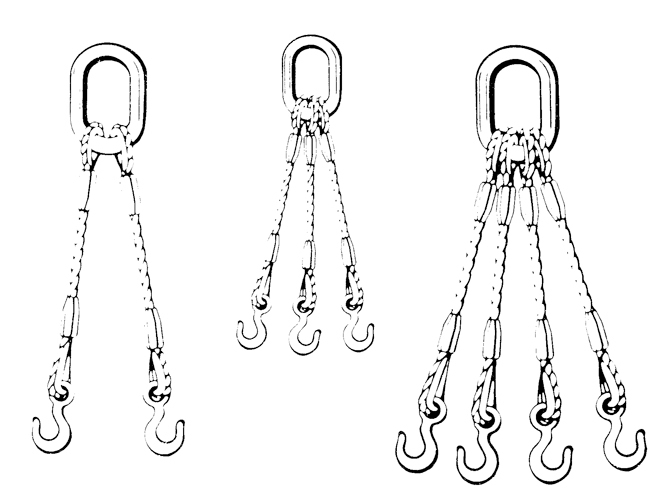 Figure 9 — Typical Endless Sling in Commonly-Used Hitches.